Mayors and other elected leaders, school boards and superintendents can signal the importance of school attendance by declaring that September is Attendance Awareness Month. The templates can easily be adapted for state leaders and boards. 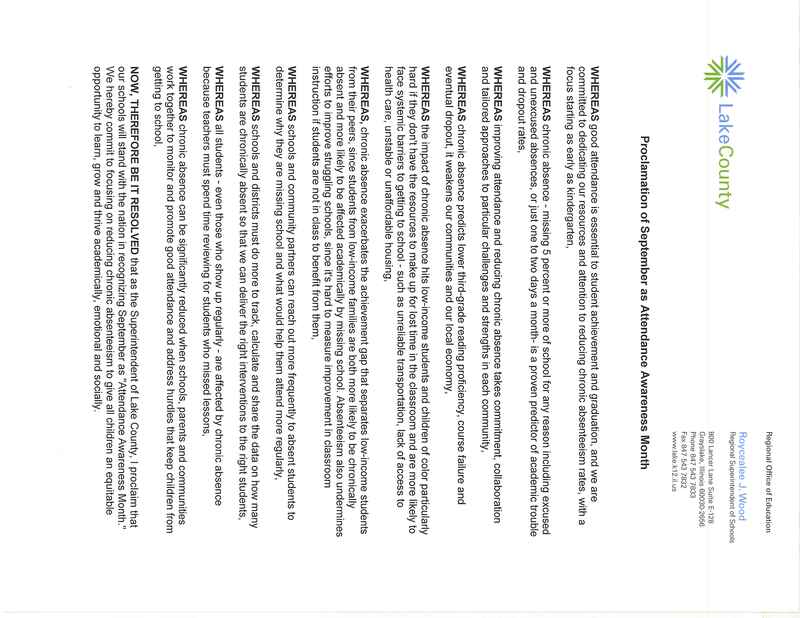 National and local organizations can also use these template proclamations and disseminate them through their networks. James E. McCoy, Superintendent of Lee County Board of Education declared September as Attendance Awareness Month. Kenneth N. Weiss, Mayor City of Avondale, Arizona declared September as Attendance Awareness Month. San Leandro Unified School District, issued a proclamation. Lake County Board of County Commissioners issued a proclamation. Broward County Public School board issued a proclamation. Board President Jolene Byrne and Superintendent M. Ann Levett of Savannah-Chatham County Public Schools issued a proclamation. David Brezee, President of Warren Township Board of Education issued a proclamation. W. David McNeill Jr., Mayor of Southern Pines declared September as Attendance Awareness Month. Proviso Township High Schools District 209 School Board declared September as Attendance Awareness Month. Catherine Danyluk, Director and Chief State Attendance Officer of the Indiana Department of Education declared September as Attendance Awareness Month. Mayor Brandi Harless and the Paducah Board of Commissioners declared September as Attendance Awareness Month. Holyoke City Council declared September as Attendance Awareness Month. Ossining Union Free School District’s President of BOE, Lisa Murray declared September as Attendance Awareness Month. Westchester County Executive George Latimer declared September “Attendance Awareness Month” in the County. Governor Dennis Daugaard declared September as Attendance Awareness Month. Dr. Matthew Plummer, President of The Varnett Public School Board of Education issued a proclamation. Berkeley County Schools declared September as Attendance Awareness Month. Alexander City declared September as Attendance Awareness Month. Hankins proclaimed September as Attendance Awareness Month. Phoenix proclaimed September as Attendance Awareness Month. State Schools Chief Tom Torlakson recognizes September as Attendance Awareness Month. Contra Costa County Board of Education issued a proclamation announcing September as Attendance Awareness Month. Natomas Unified School District announces September as Attendance Awareness Month. Mayor Dennis Coombs issued a proclamation designating September as Attendance Awareness Month. State of Connecticut Governor, Dannel P. Malloy, released a proclamation declaring September as Attendance Awareness Month. Chatham County proclaimed September as Attendance Awareness Month during the County Commission meeting on Friday, August 25, 2017. Henderson County Schools proclaims September as Attendance Awareness Month. Port Huron Schools partners with local agencies and declares September as Attendance Awareness Month. The Itasca County Truancy Prevention Program, together with school districts 316, 317, 318, and 319 pledges September as Attendance Awareness Month. Hickman Mills C-1 School District proclaims September as Attendance Awareness Month. Ponca City Public Schools proclaims September as Attendance Awareness Month. Gov. Dennis Daugaard proclaims September as Attendance Awareness Month. Gov. Gary Herbert issued a proclamation declaring September as Attendance Awareness Month. Wenatchee School District and the Washington State Office of Superintendent of Public Education proclaims September as Attendance Awareness Month. Capital Region ESD 113 in Tumwater, Washington, issued a proclamation on August 9th. The Alabama State Board of Education issued a proclamation on August 11. Palo Alto Unified School District Superintendent proclaimed September as Attendance Awareness Month. Orange Unified School District issued a proclamation on September 8. The City of Sebastopol issued a proclamation announcing September as Attendance Awareness Month. Tahoe Truckee Unified School District issued a proclamation announcing September as Attendance Awareness Month. Lamont Elementary School District issued a proclamation announcing September as Attendance Awareness Month. Kern County issued a proclamation announcing Attendance Awareness Month fro August 15-September 16, 2016. The Mayor of Firestone, Colorado issued a proclamation announcing September as Attendance Awareness Month. The School District 27J Board of Education in Adams County, Colorado, issued a proclamation of September as Attendance Awareness Month. Indian River County Officials declared September as Attendance Awareness Month. The Polk County School Board issued a proclamation declaring September as Attendance Awareness Month. Cherokee County School District proclaims September as Attendance Awareness Month. Madison, Georgia Mayor, Fred Perriman and Morgan County Commission Chairman, Donald Harris joined Morgan County Superintendent Dr. James Woodard to sign a proclamation declaring September as Attendance Awareness Month. Thomasville, Georgia City Schools’ Superintendent Sabrina Boykins-Everett issued a proclamation announcing September as Attendance Awareness Month. The School Board of Volusia County, Florida issued a proclamation announcing September as Attendance Awareness Month. Countryside Elementary School declared September as Attendance Awareness Month and also recognized an Attendance Awareness Week in September. Lake County Regional Office of Education issued a proclamation for Attendance Awareness Month. Ames, Iowa Mayor, Ann Campbell read aloud a proclamation on September 13 declaring September as Attendance Awareness Month. Council Bluffs Mayor, Matthew Walsh issued a proclamation announcing September as Attendance Awareness Month. Several area school districts and mayors pledged to promote the importance of regular school attendance to their 12,000 students. To formally recognize September as School Attendance Awareness Month in Columbia and Adair County, Mayor Curtis Hardwick and Judge-Executive Mike Stephens signed a joint proclamation recognizing September as Attendance Awareness Month. Mingo County Commission proclaimed September as Attendance Awareness Month. The Louisiana State Board of Elementary and Secondary Education and the Louisiana Department of Education proclaimed the week of April 18-22, 2016 as Attendance Awareness Week. The Butte School District Board of Trustees approved a proclamation recognizing September as Attendance Awareness Month. Buffalo Mayor Byron M. Brown issued a proclamation declaring September as Attendance Awareness Month in the city of Buffalo. School district and city officials came together to proclaim the month of September 2016 as School Attendance Awareness Month in the city of Fulton, New York. The City of Rio Communities, New Mexico issued a proclamation declaring September as Attendance Awareness Month. Thomasville City Schools proclamation September as Attendance Awareness Month. Governor Dennis Daugaard proclaims September Attendance Awareness Month for the state of South Dakota. Rapid City, South Dakota officials proclaimed September as Attendance Awareness Month. The City of San Antonio proclaimed September as Attendance Awareness Month. Governor Gary Herbert proclaimed September as Attendance Awareness Month for the state of Utah. The Winchester Public School Board adopted a proclamation at its September 12 Board meeting announcing September as Attendance Awareness Month in Winchester. The City of West Richland proclaimed September as Attendance Awareness Month. Robbie Queen, representative for Governor Earl Ray Tomblin, presented a proclamation to the Logan County Board of Education from the Governor declaring September as Student Attendance Awareness Month in Logan County and the State of West Virginia. The County Commission from Mingo County, West Virginia issued a proclamation announcing September as Attendance Awareness Month. The Alabama Department of Education launched an Attendance Awareness Campaign on September 3. Tuscón mayor and local superintendents gathered September 1 to declare support for Attendance Awareness Month. The Hawaiian Gardens City Council issued a Proclamation supporting ABC Unified School District on promoting Attendance Awareness Month on August 25. Tahoe Truckee Unified School District issued a proclamation on August 19. Lake County issued a proclamation on September 14. The City of Bradenton approved a proclamation on Sept. 9. Holmes Beach City Council approved a proclamation on August 24. The City of Longboat Key approved a proclamation on Sept. 9. Manatee County Commission approved a proclamation on August 25. Manatee County School Board approved a proclamation on August 25. The City of North Port approved a proclamation on September 3. Palmetto City Council approved a proclamation on August 2. Sarasota County Commission approved a proclamation on August 24. City of Anna Maria approved a proclamation on August 27. The City of Sarasota approved a proclamation on Sept. 8. School Board of Sarasota County approved a proclamation on September 1. The City of Venice approved a proclamation on Sept. 8. Read a blog post about efforts by the Suncoast Campaign for Grade-Level Reading. Lake County Superintendent of Schools issued a proclamation in August. Gov. Terry E. Branstad issued a proclamation on September 3. Bernalillo County Commissioners issued a proclamation on September 9. Canastota Village Mayor, Carla DeShaw, and the Canastota Village Board of Trustees proclaim September as Attendance Awareness Month in Madison County, NY on September 21. In Coffee County, proclamations came from Manchester Mayor Lonnie Norman, Director of Schools Dr. LaDonna McFall and Coffee County Mayor Gary Cordell. Gov. Gary R. Herbert issued a declaration in August. Gov. Earl Ray Tomblin declared September to be Attendance Awareness Month for Logan County and the state of West Virginia on Sept. 1. Matewan City Council issued a proclamation on August 11.
Who else is issuing proclamations? When you issue a proclamation this year, email catherine@attendanceworks.org and we’ll post your information here. Photos are welcome. Find out about the 79 proclamations issued in 2014.